Carla was smart, articulate and convincing. That’s how she hoodwinked me into renting to her in the first place. She appeared on the return day and requested a trial. She filed the required Appearance. I could tell I was in for a fight. When she came for trial, Carla brought a witness. The judge swore everybody in and asked me to state my case. "Your honor," I began, "Carla’s lease is month-to-month. On May 30th, I served her with a 30 Day Notice to terminate her tenancy." "You did not, Mel," Carla interrupted. "Don’t lie." "After receiving the Notice," I continued, "Carla did not pay rent for June. So I served a Five Day Notice on June 3rd." "So I am asking for an Order for possession and unpaid rent." The judge turned to Carla. "Your honor," she began, "I do not owe rent because I moved out before the first of June. I have a witness who will verify this." The judge looked at the witness. "Can you confirm this?" he asked. "Yes, I can. I helped her move. I was there," he said. Judge to me: "Do you have any questions for the defendant?" "No questions, your honor, but I do have a rebuttal. 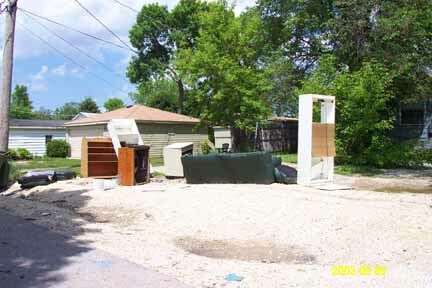 "I was concerned about the pile of trash that was accumulating next to the alley. The trash came from her apartment. "I was so concerned that I took some pictures with my digital camera. As you can see, the pictures are date stamped June 9 of this year. "I returned on June 17 and there was a lot more trash, as you can see from the additional pictures I took on that day. "Let me add that the Summons was served to her – at the apartment – on June 13. "And for your information, she just returned the key to me today in this courtroom." It was Carla’s turn. "No, I was completely out by May 31. The reason I was there on June 13 is that I came back to clean. I wanted to leave everything in good shape after I moved out." Carla was toast, and I knew it. "It is clear from the evidence that you were not out by May 31 as you claim," began the judge, "but in addition to that, you did not return the key until today. Under the law, you had possession until you returned the key." Carla sputtered, "I called Mel to come get the key, but he wouldn’t." On and on she went, while the judge patiently poked holes in every argument. And when Carla finally ran out of steam, it was all over. "Judgment for the plaintiff in the amount of $946.00. Enforcement of possession is instanter." Yes! There is no substitute for preparation.